The Samsung 2410 evaluation board is a fully featured mini ITX motherboard, based around the Samsung 2410 System On a Chip (SOC), consuming less than two watts. This board is a flexible solution for many aspects of design and usage with the Samsung S3C2410 System On Chip (SOC). It represents a solution that has enough features to be used as a prototype board, enabling the rapid development of products and is cost effective enough to be used as a small to medium integrator solution. Customisable manufacturing options allow the board to be used, even in cost sensitive applications. Simtec's commitment to complete solutions means development time for a wide range of embedded solutions can be minimumised. The supplied support CD comes with a complete cross compiling GNU toolchain which is configured to produce example embedded applications, including an electronic picture frame, simple thin client web browser, NAS unit and E-book reader. This environment allows developers to rapidly progress in the production of the customers target application without spending excessive setup and configuration time. Simtec can of course provide extensive support for every part of you project our range of services encompass every aspect of the process from development of initial concept through to final realisation. 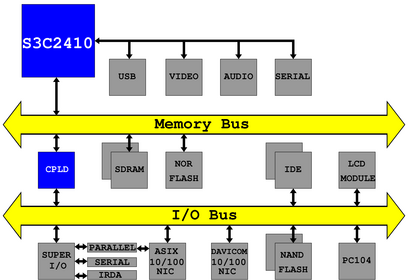 Resources - Documentation and software resources for the Samsung 2410 Evaluation Board.